Tai Chi is an ancient Chinese martial art that is now widely practiced as an exercise system to reduce pain, improve balance and more. Tai Chi is easy to do, requires no special clothing or gear, and can be done virtually anywhere. As weavers, we rely on our bodies the same way we rely on our weaving equipment. We expect them to perform for us and we are frustrated when discomfort, pain, exhaustion or injury prevents us from doing what we love. Each of our bodies presents us with unique strengths and challenges in these efforts. 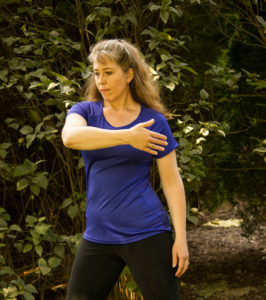 Tai Chi can show you how to get the most from your body, whatever your personal starting point. Many of the exercises can even be done while seated. Upper-body exercises include both arm and crucial waist-turning movements to promote more efficient, ergonomic movements in our daily lives. Photo by Kathy Eckhaus. Chi. The program focuses on movements and activities, such as threading the loom or winding the warp, that many weavers find painful or difficult to perform. By learning new ways to move and increasing your awareness of your body, you can improve the quality of your weaving life. In my workshops, you will learn how to make your body work better for you so your weaving time can be more rewarding. Coming in September 2017…TC4W on DVD! This is the complete program, with explanations of how to apply Tai Chi principals to your weaving activities and instructions for doing the supporting exercises. After you have gone through the program, you can then choose to see the exercises only, so you can easily keep on exercising without repeating all of the information. The DVD also includes a bonus set of core strengthening exercises.